Biff-Burger on North 12th Street offereded burgers in three sizes: the Biff Burger, the Dekuxe Biff, and the Super Biff. As the sign notes, the burgers were "Roto Broiled." From the Big Chef to Runt's hamburgers have played a tasty part in Etowah County's history. Just which restaurant sold the first hamburger in Etowah County is not known, although and early photograph of Broad Street shows an advertisment for a "Texas Steer" burger for 5 cents. But it's the 1950s and 1960s that will be remembered as the heyday of the hamburger in these parts. One of the popular drive-ins of the early 1960s were Holt's Drive-In, 2300 Kyle Ave., in Alabama City across from Emma Sansom High School. This small drive-in did not offer indoor dining but was very popular for its chili burgers. These sandwiches came with diced onions and chili at the unbelievable price of 12 for $1. 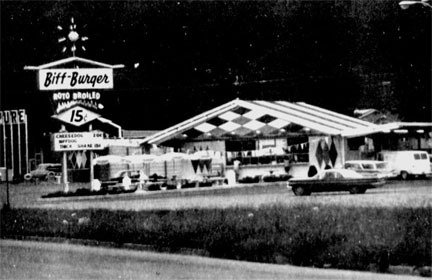 There also was a Holt's Drive-In on U.S. 411 between Gadsden and Leesburg. These drive-ins were operated by T.C. Holt. One of Gadsden's most popular drive-in was the Pic-A-Burger Drive-in on North 12th Street. The Pic-A-Burger was owned and operated by Mr. and Mrs. D.E. Locklear. This drive-in was a popular hangout with teenagers during the late 1960s and early 1970s. The Locklear's drive-in was famous for its speciality, the Paul Bunyan Burger. This large burger came with a secret sauce that gave it a distinct flavor. Accompanied by french fries and topped with an onion ring, young and old alike came to try this great sandwich. The Pic-A-Burger did not offer indoor dining. Car hops would wait on customers who remained in their cars. The Pic-A-Burger was across from the Aricola Shopping Center. Another popular drive-in on North 12th Street was the Biff-Burger, which was managed by Mrs. Jackie Autwell. The Biff-Burger and the Cheese Biff came in three sizes with a special tanfy sauce which gave them a distinctive taste. These burgers, known as the Biff Burger, a Deluxe Biff, and the Super Biff, were very popular in the early 1970s. The Biff-Burger not only was famous for its food but also for the annual "Battle of the Bands," which was sponsored by the restaurant and radio station WGAD. This was a competition where local and big-name rock groups competed before large crowds of teens. Another local hamburger chain that was popular was Jack's Kwikee Hamburgers, which were owned by Jack Alford. There was one drive-in at 601 E. Meighan Blvd. at the present site of Wachovia Bank, and another at 500 W. Meighan Blvd. These drive-ins offered burgers in three sizes. Other favorites were hot dogs, ice cream and treats of all descriptions. During the 1960s and 1970s, there were several Jack's drive-ins thorughout Etowah County. These are not to be confused with the large regional chain. Another local businessman who was innovative in the drive-in field was Art May. May opened two drive-ins in Etowah County that specialized in hamburgers. Art's was on Rainbow Drive and Art's Magic Burger was on Cleveland Avenue in Attalla. These drive-ins were popular amoung the younger crowd for their hamburgers and milk shakes. Art's Magic Burger in Attalla is still in operation, although under new ownership. Glencoe's Big Chief Drive-In was and is another local favorite. The Big Chief is a local icon that has survived the changing times. This drive-in was owned by Thomas Alford and still is in operation at 901 W. Main Street in Glencoe. This was the site for one of the great promotions in Etowah County's history. It was in the parking lot that Peggy Townsend broke a flagpole-sitting record. 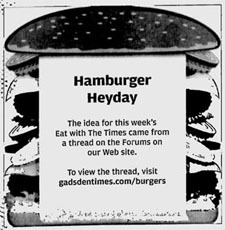 Many other great hamburger places were found throughout Etowah County. There were two Burger Supreme Drive-ins, one on Noccalula Road and one on Rainbow Drive. These were owned by James Robinson. Another popular place on the mountain was the Noccalula Nic Nac, owned by Clark Lewis. When people think of the many geat hamburgers that have been made and sold thorughout Etowah County, no story would be complete without mentioning Runt's Place on Broad Street in downtown Gadsden. This local landmark was owned and operated for many years by James H. Denson. A trip to downtown Gadsden was not complete without one of Runt's famous cheeseburgers, fries and sweet tea or a Coke. There were many other "famous" drive-ins that were as unique as the sandwiches they made popular. Whether it was Papa Joe's, the Burger House, McCuen's, Cliff's Burgers or the Chow Time, many people have fond memories of these places that were famus for their local flavor. Copyright © 2006 The Gadsden Times. All rights reserved.